Valentine’s Day is used by many to show their affection or love for someone they care about. It has spawned an industry for greeting card makers, candies, and of course flowers. However there is a real religious component as many Christian denominations celebrate it as feast day, commemoration, or optional for the local diocese (such as the Catholic Church). 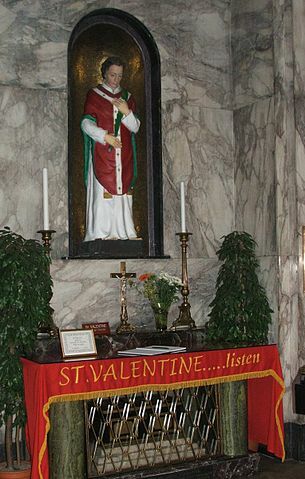 Valentine was the name of many Christian martyrs in the early Church resulting in them all being remembered for their acts of sacrifice for the faith. Some denominations, such as Eastern Orthodox Church, celebrate a particular St. Valentine on two different days. The association with romantic love could be linked to an ancient Roman festival has been made but there is no evidence of any link. Most seem to believe the link began with Chaucer’s Parlemont of Foules where he indicates birds choose their mates on St. Valentine’s Day although 14 Feb might not be the day Chaucer was referring to. Other poems made the association of love and St. Valentine’s Day in the medieval period and English Renaissance. For those who needed love verses but lacked the ability to compose them, publishers starting offering them. Then putting them on paper and sending them became possible. Paper valentines became very popular in 19th century England resulting in their industrial production. They became popular in the United States as well. With such cards being popular, you needed other things to accompany a card. Roses and chocolates became popular, likely due to skillful marketing to associate them with the day. And so Valentine’s Day became a very major day for greeting card companies, chocolate makers, and sellers of flowers (roses being the most popular flower for the day). Of course we ought to remember that it is based upon Valentine, who became a saint after he was martyred in Rome in 269 and buried on Flaminian Way. He is the patron saint of Love, Young People, Happy Marriages.